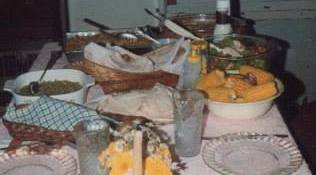 Our family Thanksgiving dinner table from the late 1980s. Thanksgiving is just two days away, Yippee! I thought I would share my Granny‘s Dressing recipe. I have great memories of her sitting in her moo moo at the kitchen table, chopping the vegetables and stirring the big bowl of moist crumbled corn bread. I still use her recipe every Thanksgiving. In a large bowl: Crumble cornbread, bread and biscuits, Then pour hot broth over bread mixture (if needed add a little hot water). Next, cover and let bread mixture steam for a few minutes. Stir bread, sauteed vegetables, and seasoning together in large bow. Next chip boiled eggs and stir into dressing mixture. Put 9 x 12 inch pan and bake at 375 degrees approximately 30 to 50 minutes. Optional: If making your own broth and want chicken in dressing, then you will debone the chicken after boiling, cut up and place pieces in with dressing mixture and place in pan.